Creating budgets is a chore most people do not enjoy. If you are currently producing a crop, the task may be somewhat easy but still takes time. If you are entering agricultural production creating a preliminary or pro-forma budget can be a difficult task. Budgets are a valuable tool to all producers and beginning producers as well. 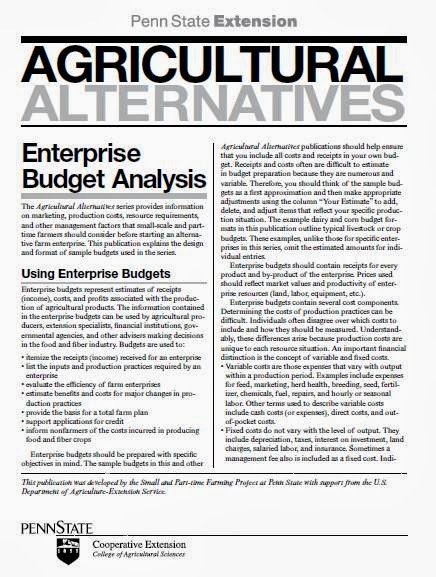 If you have been producing a crop for years and you cannot seem to determine how profitable that crop is, an enterprise budget helps make that determination. For beginning producers, producing a crop that only provides income to cover direct costs means that eventually your fixed assets (land and equipment) will be depleted and you can no longer stay in business. For existing producers, to create an enterprise budget you will rely on your current records. The budget unit may be per acre, per bushel, per head, or another common unit. Whatever you choose, consistency throughout the process is critical. You need to determine what expenses were dedicated to that specific crop or enterprise. This will take some time to separate these expenses from your totals. For example, you determine that you purchased $2,000 worth of seed for this growing season; the problem is that you planted corn, soybeans, and oats. To determine how much you spent on the oat seed you need to look through your invoices and make that determination. This example may seem elementary but you need to do this same process for all inputs including fuel, labor, and repairs just to name a few. These items are much more difficult to extract from total expenses. When you have determined your direct expenses, the more difficult task of allocating fixed expenses to each unit begins. For example, you made the calculations to determine how much fuel you used per unit, now determine how much of your depreciation is allocated to the equipment and buildings needed to produce that crop. What is the cost of the land required and how much of your property taxes and farm owner’s insurance policy is allocated to this enterprise? These are not as easy to break out of the invoices. For potential producers, these tasks are even more difficult as you do not have the current production year’s expenses to use. You need to conduct research to find these numbers. There are several places to start that have budgets and templates for your use. For agronomic crops, the Penn State Agronomy Guide has budgets for you. For horticulture crops, TheMid-Atlantic Berry Guide for Commercial Growers and the PennsylvaniaTree Fruit Production Guide are available on-line for free and printed copies are available through you local extension office or may be ordered from: Publications Distribution Center, College of Agricultural Sciences, The Pennsylvania State University, 112 Agricultural Administration Building, University Park, PA 16802-2602. Phone: 814-865-6713. On-line at: http://pubs.cas.psu.edu. E-mail: AgPubsDist@psu.edu. All of these publications contain budget sections with a column labeled “Your Estimate.” This is where you enter your figures to customize the budget. The items listed are to make sure you consider all items needed to create the budget. 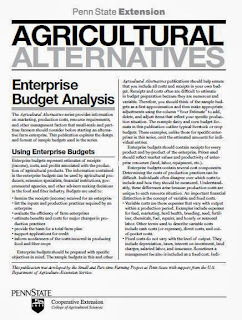 Another source of budgets for specific crops and enterprises can be found in the Agricultural Alternatives publications. There is a link to a PDF file for easy printing on the web pages. There are also links to interactive PDF budgets included in the web pages. These budgets can be customized to your operation by completing the necessary research to determine your income and expenses and entering these figures into the appropriate cells and the file makes the calculations for you. There are cells for both income and expenses and you use your figures so the document reflects your enterprise. You may print this budget for your use. I encourage you to check out the web site and discover what the project has to offer. By using these publications and the included budgets you will be better informed about the time, capital, and equipment needed for the enterprise. All issues you need to consider when creating enterprise budgets or starting a new venture or enterprise.